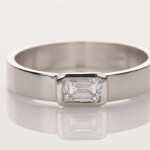 Diamond Em Cut set in the flat platinum band. This fine ring can be used as a wedding ring and quite important ring as a life ring for those natives whose rising signs are Taurus ,Libra, Capricorn & Aquarius for health, stability, defence from any crises, name, fame, establishment, life span, confidence, achievements, rewards, success, prosperity, rise in luck, comforts, recognition, appreciation, creativities, wisdom, common sense, romance, companionship, marriage, love life, arts, craft, actors, Media as a profession, Film production, direction, Luxuries, life styles, comforts, profession, status, prestige, honour, carrier & long term success. Try this ring and you will surely ”Discover the Difference” and experience the highest benchmarked quality standard in the industry.